I love a picnic! Although at times they can be a little trying, with the constantly changing weather we have here in the UK. As a chef, I grab with both hands any opportunity to eat while sitting down. Most of my meals are usually enjoyed hunched over a work bench, talking through prep lists, or with a phone pressed up against my face. So combining this with the chance of getting some sunshine on my pale tired skin, is a double “Brucie bonus”! There is always a sense of nostalgia with picnics for me. I grew up in cities as a kid, but a few times a year we would fly back to the UK to see family and if the famous Leicestershire weather was holding out, a picnic in Bradgate Park with my grandparents was always on the cards. The food was exactly what is meant to be! Melton Mowbray pork pies, Red Leicester and pickle rolls, Walkers crisps, Tizer and Penguins! What more could a skinny Canadian kid want? Plus at this point in my life I wanted to be Robin Hood when I grew up, so to be in that landscape with all those woods and buildings, was absolute perfection. Oh and a 99 with a flake on the way out, these all sound like simple things now but at the time I was ‘living the dream’! I never realised it until I just wrote this, but back then, just as it is now, locality was such an important thing. I guess it must have been drilled into me then without even noticing it. 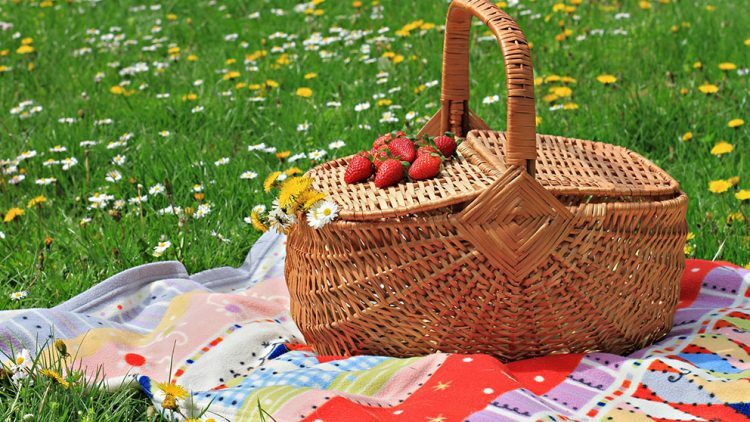 To this day, I pretty much base my picnics around the same type of menu as my Nan did. Always a pie, loads of cheese, great bread, fruit, crisps, nuts, olives or just loads of picky bits. Invest in a good cool box. It is a worthwhile investment, nothing dampens spirits more than a leaky cool box. Buy a good thermos for tea. Drinking tea outside reminds me of my grandparents, so I never go without one. Do your prep the day before. Choose your equipment carefully – check plastic boxes are shut tight, and wrap any strong smelling items in a ziplock bag. Plastic cups or bottles are best to avoid breakages. Avoid soggy salads and sandwiches by keeping dressings, fillings etc. in separate containers until they’re needed. If you’re bringing cork-sealed wine or beer, don’t forget the cork screw and the bottle opener! Try and get your bread fresh on the day. A quick drizzle of water and 10 minutes in the oven will be perfect if your bread is a day old. Turn your phone off and just take a couple hours to think about nothing, it’s massively under rated. If you fancy making your own bread this recipe is easy to make and very tasty. Homemade sausage rolls are perfect for picnics and these ones can be made the day before. If you’re looking for something refreshing to drink, this homemade Iced Limeade is delicious.